The onset of autumn in South Carolina brings out even more motorcyclists than the summer — the weather is milder, the sun doesn't beat down quite so hard, and the view is simply spectacular. Whether you're taking a day trip up to enjoy the mountains or headed down to the coast, it's important to stay safe! Motorcycle accidents can cause serious physical injury or even be fatal, so it's essential to take every safety precaution you can. 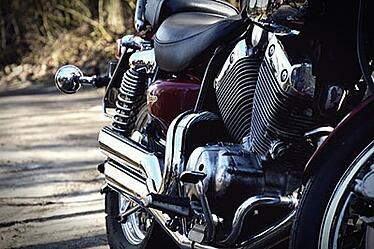 We have a few tips to help you stay safe on your motorcycle this fall. In South Carolina, helmet use is only required by those under the age of 21. It's not unusual to see many motorcycle riders headed down the highway wearing just a hat or even no head protection at all. Many people believe that helmets don't actually help, but studies have shown over and over again that regular helmet use sharply reduces the chance of serious head injuries in case of a collision with another vehicle. Make sure your helmet fits properly, is designed for wear at high speeds, and most importantly, that you wear it every single time. It's also important to replace your helmet after every accident. There's a reason motorcycle riders are often sporting a leather jacket — long sleeves and thick fabric are far more protective in case of a collision than a thin cotton shirt. When you go out for a ride, be sure to always wear long sleeves and long pants. Leather jackets can help protect your arms and torso from abrasion, and thick-fabric blue jeans or pants can provide the same protection for your legs. You'll also want to make sure you're wearing gloves and very sturdy shoes. Never go out on a motorcycle in footwear tht doesn't have protective properties — that means no sandals! If you're riding in the evening, consider adding reflective patches for extra protection. Last but not least, consider picking up protective eyewear, such as scratch-resistant goggles. While some helmets come with a face shield, that's not true for all of them, and eyewear not only helps to keep bug-splatter from affecting you, they can also help protect you from gravel kicked up by other vehicles. Because motorcycles leave their drivers more physically vulnerable in accidents than regular vehicles, it is even more important to keep up with basic maintenance than it is on cars or trucks. Schedule your regular check-ups to match the manufacturer's recommendations, and take great care with your motorcycle to ensure it is properly maintained and kept up. Make sure any issues, no matter how small, are checked out by a professional. Before you go out for a ride, check on your tires, lights, and controls every time. Even small mechanical defects can lead to serious accidents while on a motorcycle, so you really can't be too careful. Much of this advice may seem basic, but when the leaves change colors and the day is perfect, it's easy to get distracted by the gorgeous views available here in South Carolina and pay a little less attention to the road. Please, always stay alert while out on your motorcycle. It could be the difference between a collision and a beautiful ride. Been in a Motorcycle Accident? Give Us a Call. At Bluestein Attorneys, we have experience working with those who have been in motorcycle accidents. We've made it our mission to ensure our clients here in South Carolina have their individual rights protected. If you've been in an automobile accident, motorcycle accident, or a wreck involving a tractor trailer, we'd be happy to speak with you about your situation. Reach us by phone at (803) 779-7599 or contact us online to request your FREE consultation!